If your organization has social media profiles across Facebook and Twitter for individual products or services, Zoho CRM makes it easy to manage them by adding the profiles under a Brand. With a tighter integration with Zoho Social, Zoho CRM seamlessly synchronizes all your brand profiles and settings in real time. Spend less time setting up the system, and more time closing deals. 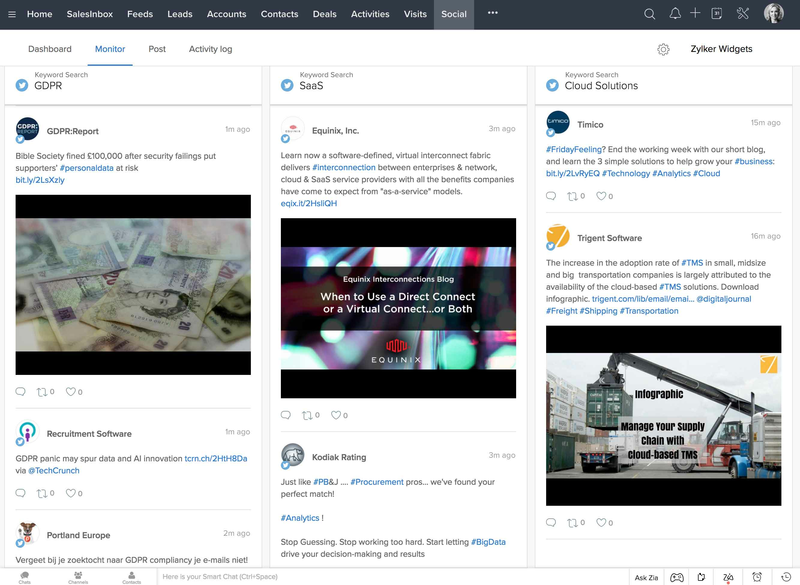 Manage all your social media conversations in real time with your prospects across Facebook and Twitter. From sharing content to closing deals, get everything done right from the Social Tab in Zoho CRM. 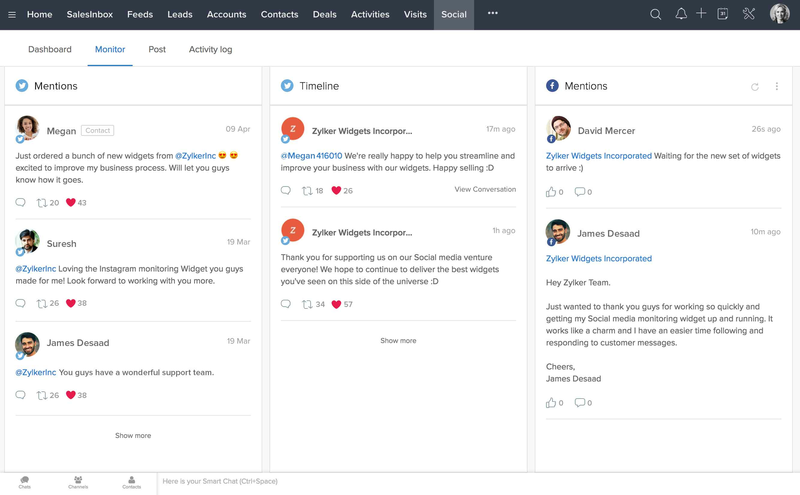 Your social dashboard allows you to focus on the social media conversations important to your business. Follow posts and conversations from your leads, contacts, or potentials, and stay ahead of the curve. Manually add leads from the Social Tab, or automate your lead generation. 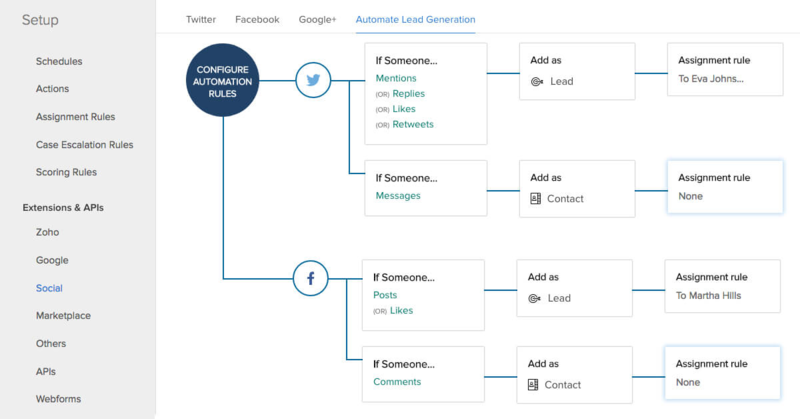 Set up triggers to automatically add leads and contacts from social media based on the kind of customer interaction. 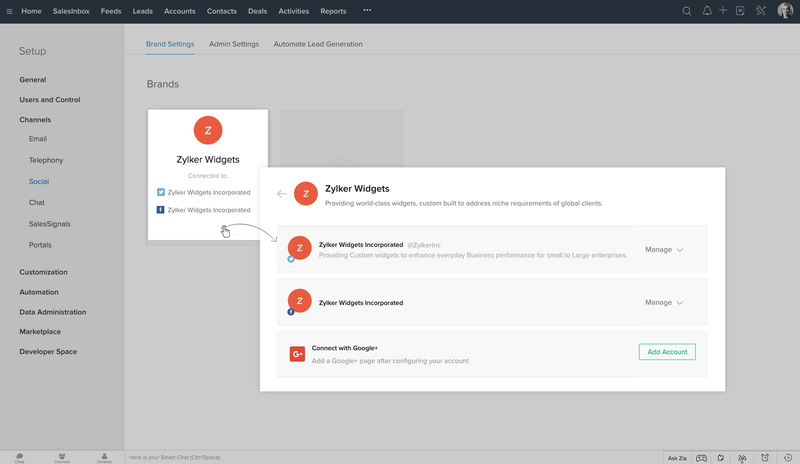 Automatically assign leads and contacts to your sales reps with assignment rules, tasks, and reminders. Create your own listening Streams. Follow what your prospects and competitors are saying about your brand on Twitter with keyword tracking in the Monitor Tab. Listen to live updates from your prospects to understand what matters to them and find the right time to get in touch. Once a contact has been added to Zoho CRM, access their information, deal history, and activities from the Social Tab. 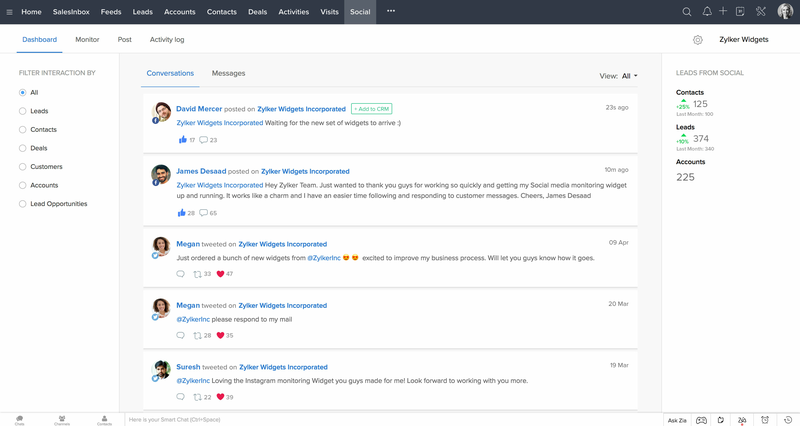 See the most recent social conversations your business has had with your contacts. With real-time information, you'll never miss out on the sales context in your responses to tweets and posts.